The Harrison County Sheriff's Office has the capability to submit fingerprints electronically to the Bureau of Criminal Identification and Investigation (B.C.I.& I.) as well as the Federal Bureau of Investigation (F.B.I.) for the purpose of receiving a background check for employment reasons only. B.C.I.& I. and F.B.I. have stated that they will not accept any background checks that are submitted on fingerprint cards unless otherwise instructed by these entities to submit the fingerprints in this fashion. Most of the time fingerprint cards are used when the WebCheck system will not capture an individuals fingerprints. However there are still some employers who require the fingerprints to be taken on a fingerprint card. These employers have permission from B.C.I. & I. and F.B.I. to submit fingerprints on a fingerprint card for a background check. When an individual needs a background check that requires submission of fingerprints you should be instructed by your employer which type of background check you need to complete. Whether it be submission of fingerprints through WebCheck or mailed to the agencies on a fingerprint card, the Harrison County Sheriff's Office is capable of completing both types of fingerprint submissions. The Harrison County Sheriff's Office will conduct WebCheck submissions as well as fingerprinting on fingerprint cards Monday through Thursday during the hours of 9:00am to 3:00pm. The Harrison County Sheriff's Office requires the following items or information to complete a WebCheck for an individual. Some employer have an agreement with this office for the cost is billed to the employer. Payment can be in the form of a personal check, money order, or cash. If paying in cash you must have the exact amount, this office does not have any means to break down any form of currency. 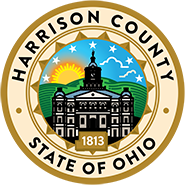 For any questions regarding background checks please contact the Harrison County Sheriff's Office at (740) 942-2197 or the Civilian Identification Department of the Bureau of Criminal Identification and Investigation Monday through Friday toll-free at (877) 224-0043 between 8 a.m. and 4:30 p.m.